With Christmas around the corner, you might be thinking of buying a loved one a brand new iPhone Xs, or perhaps you'll receive one yourself. Unfortunately, the stock accessories that come with your iPhone are rather barebones; all you receive is a Lightning cable, a pair of EarPods with a lightning dongle, and a 5W USB charger. If you want to give your iPhone more functionality out of the box, this $34.99 iPhone Accessory Bundle is for you. Everything in this accessory bundle offers a more robust experience than the iPhone’s stock accessories. Right off the bat, the included 10-foot MFi-certified Lightning cable is longer than Apple’s included 3-foot cable. 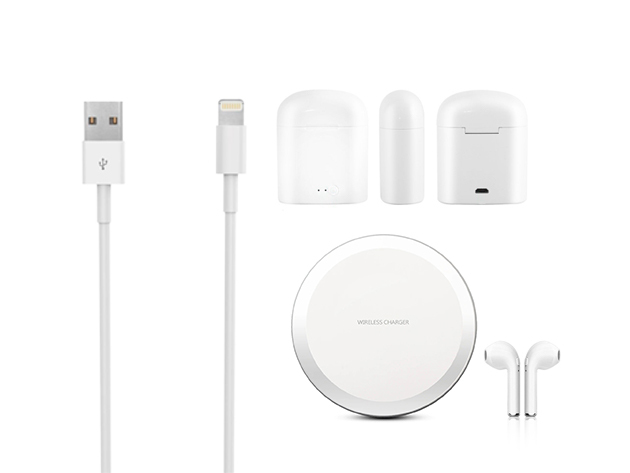 Also missing from the stock experience is a wireless charging base; this accessory bundle features a Qi-wireless enabled charger that allows you to charge your iPhone without connecting it to a Lightning cable. Pairing this with your new 10-foot cable makes it the perfect desk or nightstand charger. Finally, you’ll find a pair of sleek AirPods-inspired Bluetooth earbuds so you won’t have to fumble with a pesky Lightning dongle. The iPhone Accessory Bundle offers everything you need to enjoy your new iPhone to the fullest straight out of the box, and you can buy it from the Macworld Shop for $34.99, or 73% off. This story, "Enhance your iPhone with this $35 iPhone Accessory Bundle" was originally published by Macworld.